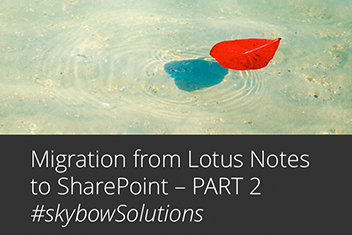 Migration from Lotus Notes to SharePoint - easy with skybow - Part 2. With “Case files,” you can easily model data structures needed for the “Request for Leave” solution: list of employees, their superiors, their requests, and request approvals or rejections. With skybow Solution Accelerators, you are able to define totals and aggregates on that data immediately, so enterprises can know right away how many requests for leave have been submitted, the approval rate, the number of requests still awaiting approval, etc. The best part is that skybow Solution Accelerators do not mess with the data, do not leave any “dirt,” and do not include third-party systems. Everything is stored in SharePoint, and all the customizations are done in appropriate SharePoint structures – easy to understand, migrate, and manipulate. Once data structures and data model have been created, the next step is creating the user interface for the solution. The user interface is the first thing that users see, and it is one of the decisive factors in solution adoption and acceptance. For that “Request for leave” use case, users will need data entry forms for entering their leave requests. SharePoint offers linear entry forms out of the box, which is not always the most convenient way. Grouping the fields, separating them by tabs, and making fields visible, or enabled, based on the current user’s role, would be a much better way – to fill that gap, this is where skybow Solution Accelerators come into use. Visual indication of the number of days that can be requested for leave, as well as form validation that would prevent a user from requesting more days than she is entitled to, would further increase the solution adoption and acceptance, and decrease unnecessary processing steps. While this is not easy to achieve with out-of-the-box SharePoint functionality, it is fairly easy with skybow Solution Accelerators: user interfaces can be well designed, dynamic, and helpful to the user in every possible way.